Contrasting yoke with hand embroidery on a graceful ikat dress. Pullover dress with softly gathered skirt. • Length: PM 38" M 40"
It is a perfect fit, well made, and a joy to wear. The material and embroidery on this dress are very nice; I was excited when I took it out of the package. However, I had to return it because it did not fit me. It was a little too short and too big and boxy up on top - there was a lot of extra material around the shoulders and under the arms. The sleeves themselves are much more bell-like than in the picture. I'm hoping I get luckier with the rest of my order. This dress is a real winner. Icn wear it anywhere, dressing it up or down. It is perfectly comfortable and very attractive on. 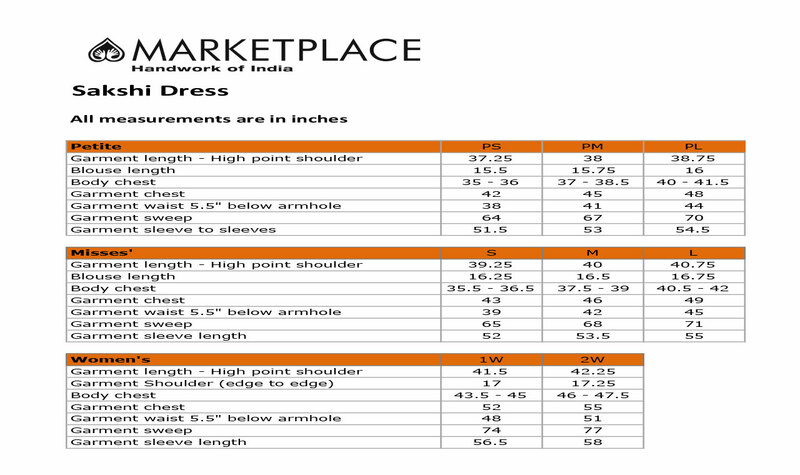 Marketplace dresses are well priced, well made, and lovely.